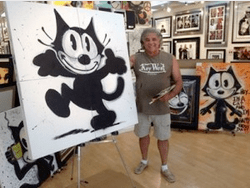 DENVER, June 23, 2015 /PRNewswire/ — Soho Art International/Soho Prints Digital Arts Ltd., today announced a development and distribution partnership with artist Don Oriolo for an initial artwork collection of Felix the Cat original works of art created by Don Oriolo. 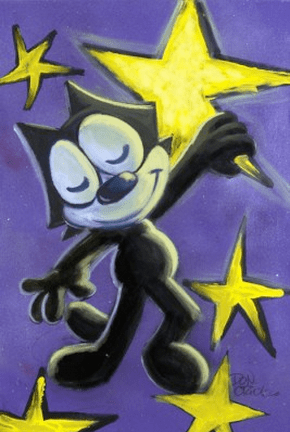 Through this partnership, Felix the Cat will be reintroduced to the world in the form of fine art originally created by Don Oriolo including original film cells of Felix the Cat from prior motion pictures and TV series plus signed musical instruments from The Don Oriolo Felix the Cat Guitar Collection. 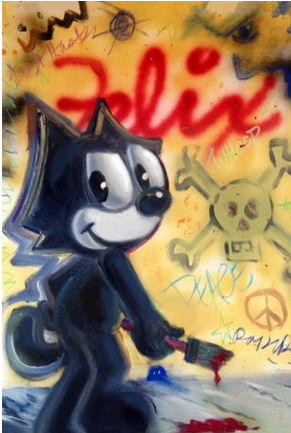 Under the terms of the new agreement, Soho Prints will have the exclusive rights to produce, market and sell a number of limited edition artworks featuring Felix the Cat from an initial allotment of pre-approved artwork. From the silent film era of the early 1920’s to being the first animated character balloon to be featured in the Macy’s Thanksgiving DayParade, Felix the Cat has always been a beloved icon in American popular culture. In 1953, when Felix the Cat was looking for a new direction, Joe Oriolo, a young and very promising animator, took the helm of the Felix the Cat company, redesigning Felix and creating the fresh new look and feel of the character. Oriolo also created a roster of cartoon personalities including “Poindexter”, “the Professor”, “Vavoom,” “Master Cylinder”, etc., and many in the industry feel he made it possible for the Felix TV series to be fully accepted by the entertainment industry and a worldwide audience of Felix fans. The brand new TV series aired throughout the world with great success. Soon thereafter his son, Don Oriolo emerged as the new keeper of the Felix flame. For almost 50 years, Don has worked to take the character to an even higher level, increasing Felix’s visibility and popularity through successful licensing programs and also by developing and producing motion pictures and TV programs. DreamWorks Animation LLC avidly pursued Felix the Cat and purchased the character in May of 2014. The character “Poindexter” was not part of the sale and was retained by Don Oriolo. Don Oriolo also retained the rights to create, develop and distribute of all his Felix the Cat fine art creations for years to come. The exclusive artworks, available soon from Soho Prints, will feature Felix in various themes and situations such as, sports, music, holidays and various everyday activities seen from Felix’s point of view. Original works of art will be available along with 100 limited editions of each piece. All artwork is signed and numbered by Don Oriolo and supplied with a Certificate of Authenticity. Soho will also feature certain instruments from The Don Oriolo Felix the Cat Guitar Company’s exclusive line of guitars, basses, ukuleles and banjos along with a limited number of framed, signed and numbered original film cells available soon exclusively through sohoprints.com. About Soho Art International/Soho Prints Digital Art Ltd.
Soho Art International/Soho Prints Digital Art Ltd. specializes in the representation and sale of exclusive artwork from artists from around the world. We sell original artwork, produce and distribute ready-to-hang limited editions and open edition canvas wrap prints, plaque mounted framed art and placards. Our management team each has over 25 years of experience in the fields of fine art sales, galleries, artwork reproduction, art installations and entertainment merchandising. Utilizing the latest in digital technology, Soho Prints produces the finest quality canvas-wrapped prints available today. The press release probably wisely does not mention the controversy over who created Felix the Cat in 1919: Pat Sullivan, who owned the NYC animation studio that made the famous Felix theatrical cartoons throughout the 1920s, or Otto Messmer, Sullivan’s head animator. Some say (as Sullivan did) that Sullivan created the character and that Messmer animated it under Sullivan’s direction. Others, including most animation historians today, say that the quiet and publicity-shy Messmer created Felix for Sullivan and was given free rein to write and direct all the animation (and draw the newspaper comic strip), and was happy to let Sullivan claim all the credit. What is known that when Sullivan became unable to keep his studio open due to acute alcoholism in 1932, his brother in Australia offered Messmer the studio to keep it going and producing new Felix cartoons. Messmer declined, and the studio fell apart. There is no question that the Felix animation was ancient history when animator Joe Oriolo brought it to television in 1953, and brought the character back to life in a series of 260 new TV cartoons in 1958-1960 with Felix’s “magic bag of tricks” and original supporting characters. Although Oriolo created other TV animated series in the 1960s such as The Mighty Hercules and Johnny Cypher inDimension Zero, the Felix series was his lasting success. When Joe Oriolo died in 1985, the Felix rights were inherited by his son Don Oriolo, who had grown up with the character. In 1988 Don Oriolo authorized a Felix theatrical produced by a consortium of 27 studios, mostly European, and written mostly by him. Don Oriolo is a guitarist and painter with over a hundred Felix paintings to his credit. Most are suitable for art galleries. They are in practically every medium available (watercolor, gouache, oils, markers, Prismacolor, etc.) and as many art styles (cartoon, cubist, surrealist, abstract, Fauvist, etc.) 132 of them were reproduced in full color in the 2014 Felix the Cat Paintings. Now, according to the press release, Don Oriolo and Soho Prints (headquartered in Englewood, Colorado and with art galleries from Las Vegas, Nevada to Kuala Lumpur, Malaysia; São Paulo, Brazil; Brisbane, Australia, and many other cities) are offering Felix original paintings and prints, plus animation cels and similar items for purchase by the public. Contact them for prices and further information if you are interested. Twisted Tales was the best Felix.